Wouldn't you like a story you can tell forever? Leaping into space with only a slim cord attached to you is one of them. 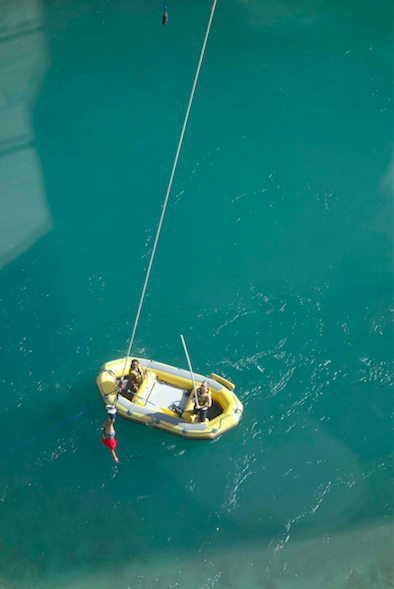 Queenstown, New Zealand boasts of being the adventure capital of the world. New Zealanders, better know as “Kiwis,” have nurtured that reputation by taking risks many sane people would run from. A must-do for any adventure traveler or visitor who delights controlled terror. 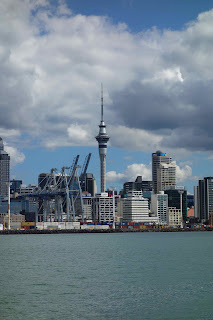 With plenty of Kiwi places to toss one’s brains around, the two that stand out are Queenstown’s scenic Kawarau Bridge and Auckland’s own famous Sky Tower. 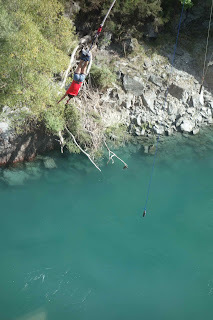 These vastly differing risks (cliffs or concrete) will still make you shell out almost $200 to leap 760 feet off a narrow bridge into near nothingness between a stone gorge with a river….or drop about $225 diving about 630 feet from a concrete and steel observation deck at speeds as much as 85 m.p.h. Expensive – yes. Better not to ask about insurance costs. Relax. 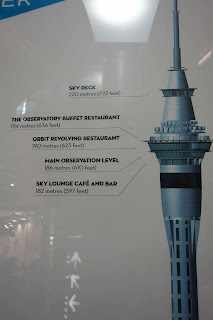 The Sky Tower is guide-cable controlled so as far as we know brains, not bodies, get smashed around. You’ll heal. 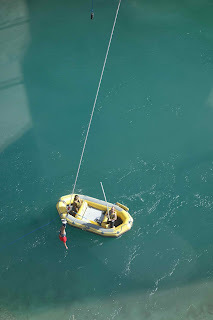 The scenic Kawarau Bridge jump has a nice little bobbing inflatable waiting to load stunned jumpers for a return to shore. Once you get your voice back, it’s the stuff of party talk and therapy for years to come. Kawarau Bridge Step One: Gear up on the bridge suspended between two cliffs with both life jacket and bungee cable, close your eyes and jump. Step two: Open your eyes, idiot – you paid nearly two hundred bucks to show off! 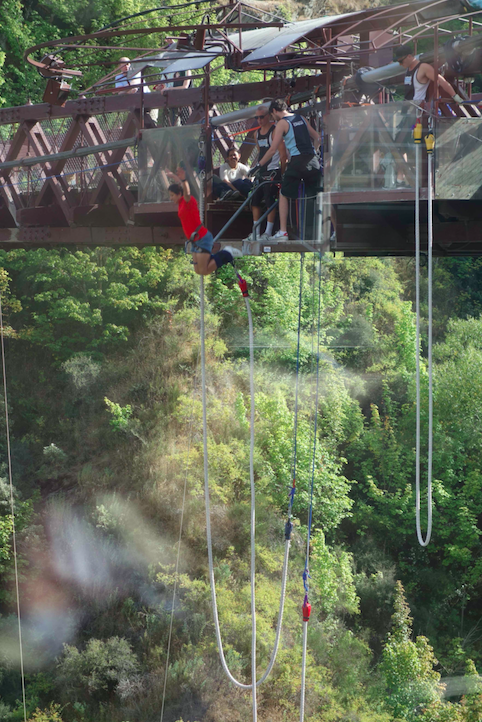 Step three: Keep down your stomach contents while your bungee line bounces you close to the river. Step four: Just keep hanging there, upside down, while your survival depends on the trusty rafters pulling you in. 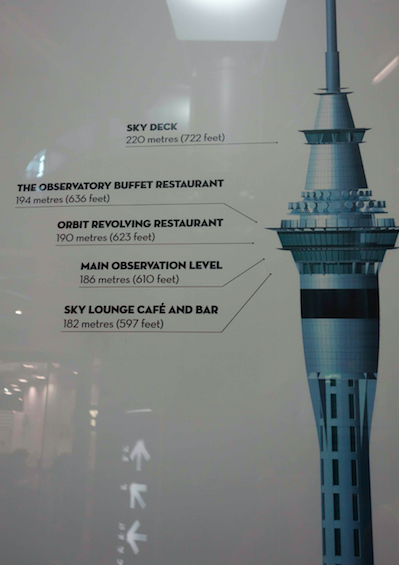 Sky Tower Step One: Observe the tallest man made structure in the Southern Hemisphere from afar. Focus on your bucket list or at least that lust for thrills. Step two: Shell out a ton of money, ride the elevator to a dazzling height, zip up your diving suit and get hooked up. 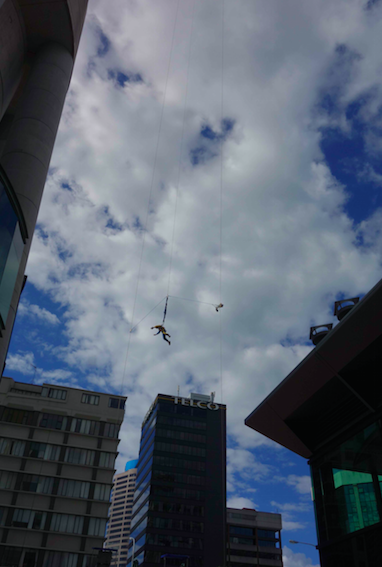 Step three: After you’ve taken the leap, start questioning your sanity as you swing between the steel and concrete. 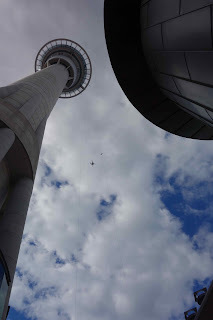 Open your eyes idiot – this leap costs as much as that nice hotel room! Step four: Make sure your friends see you last act of idiocy before you go out and drown your terror in great local beer at on of the three lounges in the high Tower. There are a few things you might want to know about before you shell out the cash. First, between 1986 and 2002 there were only 18 reported fatalities from bungee jumping. What's happened since then is anyone's guess. 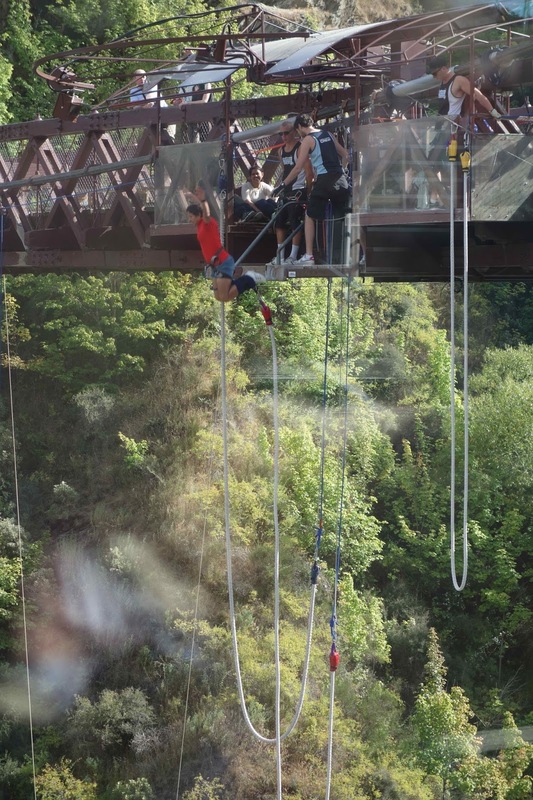 The risks of having an accident while bungee jumping are about 1:500,000. 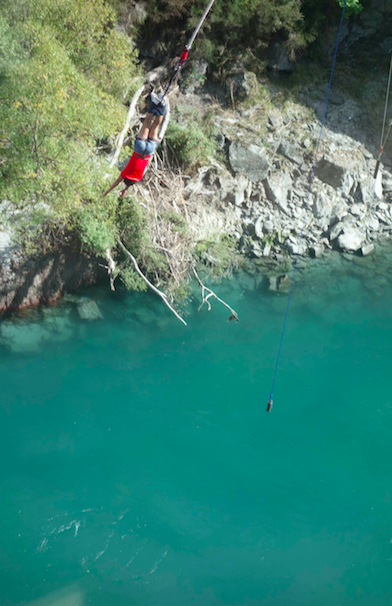 And finally, to put your mind at rest, taking a bungee jump is about as dangerous as driving 100 million miles in the U.S. Step One: Gear up on the bridge suspended between two cliffs, close your eyes and jump. 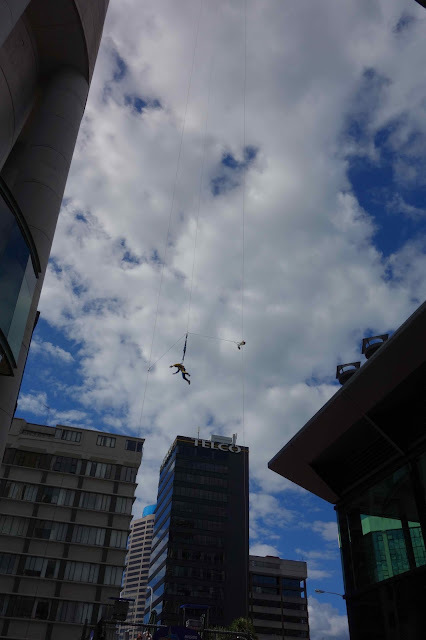 Step two: Open your eyes – you paid nearly two hundred bucks to show off! 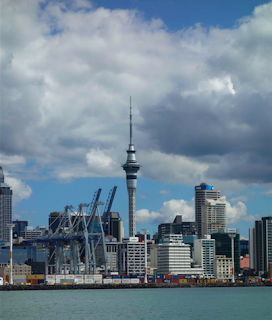 Step One: Observe the tallest man made structure in the Southern Hemisphere from afar and remember your bucket list. 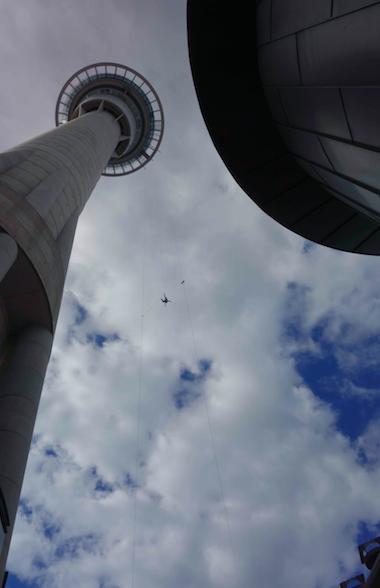 Step two: Get hooked up (after paying a lot of money and taking the elevator up that dazzling height). 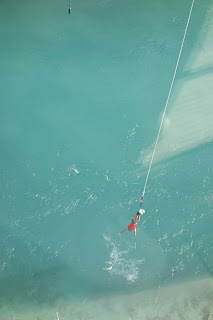 Step three: After you’ve taken the leap, start questioning your sanity as you swing between the steel and concrete. Step four: Make sure your friends see you last act of idiocy before you go out and drown your fears in great local beer.